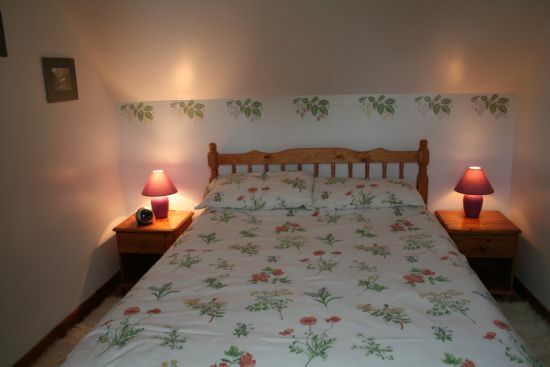 The Summer House is a renovated farm cottage at Knockankelly Farm, Whiting Bay. The farm is situated on the outskirts of Whiting Bay, on the Isle of Arran, above the village and beach, (approx, 1 mile), also overlooking the Holy Isle and the Ayrshire coast. The cottage is well fitted, comfortable and cosy and is open all year round with short breaks* available in the winter season. We have electric central heating for all year round warmth, and the cottage has a fully fitted kitchen with all you need for your stay. Sleeping accommodation is on the first floor and comprises of a double bedroom and a twin bedroom. There are plenty of good eating places in Whiting Bay or in nearby Lamlash. Come and stay and see for yourself - the cottage is a warm and comfortable haven after you have spent the day walking the hills, cycling, horse riding, sightseeing or whatever else you want to do - or just come and chill. *Short Breaks of up to 3 nights are available for 2 or 3 people outside the main Summer and Christmas seasons, good for a mountain biking weekend. Just contact us with your requirements. Cyclists, Bikers and Walkers are all welcome, we can assist you with drying wet boots or waterproof gear and we have safe off road parking for bikes and motorbikes. We can also advise you on local mountain bike routes, some of which run right through the Farm, and the conditions you can expect on them. We also have the gear on site for you to clean and sort your bike (or motorbike) ready for the next day! We are very environmentally aware here at Knockankelly Farm. The farm is run using natural fertilizers and no pesticides, and because of that, our animals have a much greater variety of natural vegetation to browse and eat. This also means that we have masses of wildflowers on the farm, along with plenty of wildlife, including red squirrels, buzzards, bats and red deer. In spring we are also visited by plenty of swallows who set up home in the farm buildings. Swallows eat plenty of midges, so they are very welcome! We are also in the RSPB Volunteer and Farmer Alliance scheme, which means that our farm has been surveyed by the RSPB and we have a comprehensive list of the birds that live here. Please note that all photographs are the copyright of Penny Hamilton LRPS. The kitchen is fully equipped with everything you will need for your stay, and is all electric, including cooker with fan oven, fridge, microwave and washing machine. 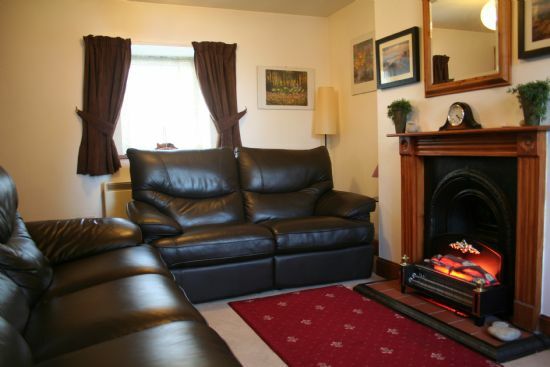 The lounge is a lovely cosy area with TV and DVD player, and sumptuous squishy leather sofas for relaxing. The lounge, dining and kitchen areas are open plan over the whole ground floor of the cottage, which gives a lovely airy feel and it means that no-one is stuck in the kitchen whilst everyone else is relaxing! There is a small patio as well which extends the open feel even further. The double and twin bedrooms both look out towards the Ayrshire coast and Holy Isle. They have cam style ceilings and the original wooden floor has been renovated. 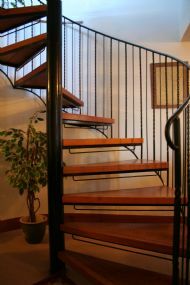 The bedrooms are reached by a beautiful hand made spiral staircase which has wooden treads made from an Arran tree. 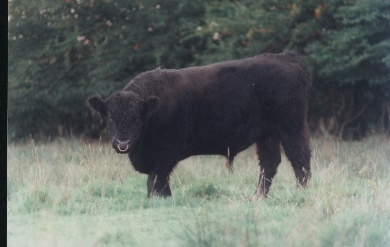 Galloway Cattle have a unique double coat, long and silky on the outside, with a short thicker one below it for insulation. This enables them to stay outside in all weathers without getting too cold - sometimes you will see them with snow on their backs and they don't seem to notice it at all! 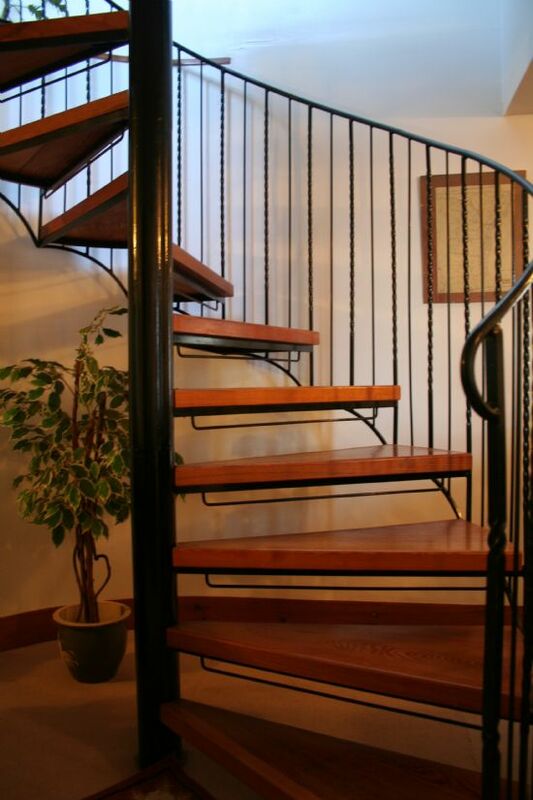 This is the spiral staircase mentioned above. Handmade in Whiting Bay with wooden treads which were made at Kilmory Workshop from an Arran tree. 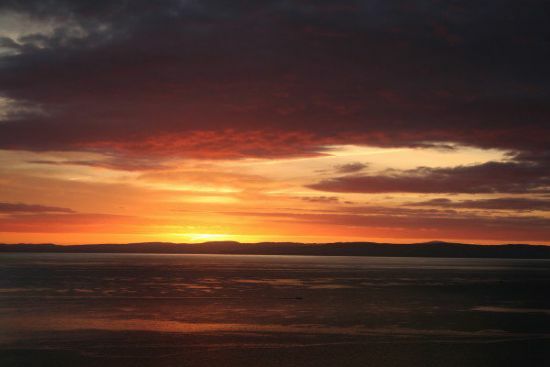 This is the sun rising over the Ayrshire coast - you'll need to be up early to see it in the summer though! We hope this gives you an idea of what we have available at Knockankelly Farm, if you have any queries, please just contact us using one of the methods listed below or, if you would like to check availability, or make a booking with us, please click on the Check Availability link on the left of this page.